Skilled labour costs require abrasives that work quickly and effectively and can also be changed with minimal down-time. Loop backed discs offer the great advantage of a quick change and firm grip beneath the working surface. We offer an extensive range of grip backed products for the trade professional. If you can't find the size or grade you require, we can probably have the factory press them out for you - please ask. Zirconium abrasive sanding discs are best on stainless steel and hard alloys. They give higher performance and greater durability. Surface Conditioning or SCM discs remove light surface coatings and produce a range of bright finishes, depending on the grade used. 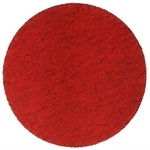 Aluminium oxide sanding discs suitable for both wood and metal. Trizact™ grip backed discs are fast acting on stainless steel and hard alloys and help produce a smooth flat finish after welding in fewer stages. Unitised grip discs fit quickly onto a suiatable backing pad and complete a system to quickly polish metal. Silicon carbide grip sanding discs are preferred for use on aluminium and copper as well as on wood, plastics and acrylic. We stock ceramic abrasive grip discs, in the high performance FX87 material which is a great substitute for 777 Cubitron discs. This conversion disc enables you to switch from PSA backed discs to grip backed on disc sanders.